Today Movie Critical embarks on a new journey. Not only will we still be featuring films currently showing in cinemas, but we will also be reviewing several films that are being shown or have recently been shown at film festivals around the world. The first film festival which we are honoured to be reviewing films from is the Soho International Film Festival. The annual Soho International Film Festival ran in New York City from the 18th till the 21st of February 2010 and featured many notable films. Among them was our first film to be reviewed, “A Kiss Of Chaos”. “A Kiss Of Chaos” took away the honour of being the Best Showcase Feature Film, an outstanding achievement for director Ricardo Sean Thompson. And a well deserved award it is. “A Kiss Of Chaos” is completely gripping and full on from start to finish. The major aspect I really admired in this film is that the crime thriller with a strong female character as the lead. Stereotypically, crime dramas and thrillers where the subject of the crime is illegal drugs tend to have male lead characters, but not this one. Judy Marte plays one of the strongest female lead characters I have seen on screen in a long time. For how much she endures throughout her life and especially on this night, she remains stronger than the people around her and does not show any sign of weakness. Phoenix could well be one of my favourite characters of the film year. These are my words and here is my review. 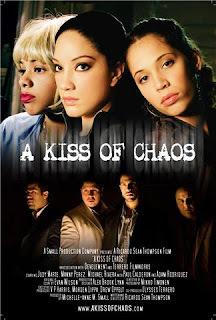 “A Kiss Of Chaos” is exactly as the title suggests, chaotic in the most amazing way. The film by Ricardo Sean Thompson is captivating right from the opening scene and does not lose momentum throughout its duration. The film is definitely not for the faint hearted and does require quite a strong stomach, but it is to be enjoyed by anyone who can admire great film making and story-telling. Phoenix (Judy Marte) is a young artist who is trying to overcome the turmoils she experienced in her childhood. However, this birthday of hers only makes this harder and makes her life more chaotic. Her wounded trouble maker ex-boyfriend, Angel (Michael Rivera) turns up on her kitchen floor just before Phoenix’s younger and overtly jealous sister, Isis (Gleendilys Inoa) calls for help. The only person she feels she can trust is her best friend, Tiffany (Stephanie Ortiz) who see’s Phoenix as more than just a friend. Phoenix ends up in a web of drug crime and it is unclear whether she and everyone around her will survive the night. Thompson is indeed an amazing film maker. “A Kiss Of Chaos” is completely original and not predictable at all. There is twist after twist in the film, none of which the audience see coming. It is completely compelling. Just like a car wreck, the audience watches and cannot turn away from watching Phoenix’s life go from bad to worse, not because of her own actions, but because of the people who disrupt her night. The script is well written and the cinematography is also notable. The musical score is appropriate in all the right spots and adds to the emotion of the film. Be warned though, there are some strong themes and images in the film so be prepared to not be relaxed for an hour and a half. The characters development and acting are also very strong points. The script provides great character development as well as the flashback scenes. Judy Marte is an absolute stand out as Phoenix and perfectly cast. She shows tremendous talent in executing an emotionally tired but strong character. The audience truly feels a connection with her and her strength. The audience also feels a connection with both Angel and Isis, but not as favourable a connection as that with Phoenix. Michael Rivera’s Angel is not a likable character with his shrewd behaviour and treatment of his ex, especially when younger sister Isis steps onto the scene. Both Rivera and Gleendilys Inoa’s characters are not likable at all, a tribute to their acting. Inoa’s Isis is completely crazy and scary to watch. “A Kiss Of Chaos” is not yet available for release, but if you do get the chance to see it at a screening, definitely go to witness a success. Phoenix is definitely a character to be remembered and celebrated, as is Thompson’s direction. “A Kiss Of Chaos” is definitely a film that does not hold back on issues that are often seen as taboo in society and on screen. Completely chaotic and enjoyably confronting and compelling. “The Kiss of Chaos” is an extraordinary experience that pulls you in trying to analyze each character's psyche. This amazing urban psychological thriller will leave you with an intense heaviness. One of the best movies of the year!! !